No. 318 Squadron Picture Gallery. Part 1. 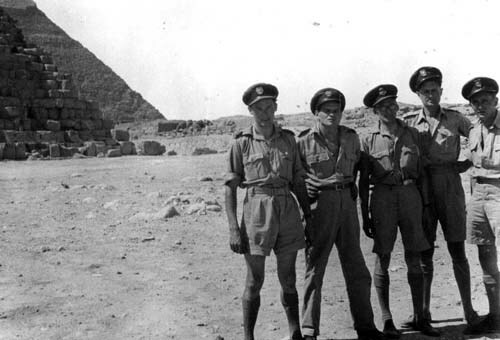 Visiting Acre, September 1943. 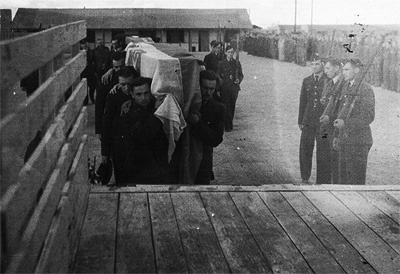 Left: Turek (left), Moszynski, Uchwat. 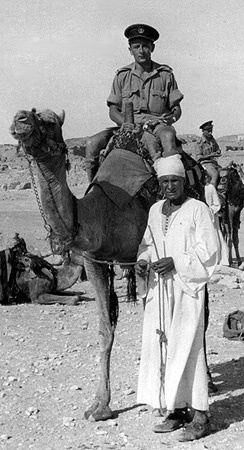 Right: F/O Glowacki on a camel. 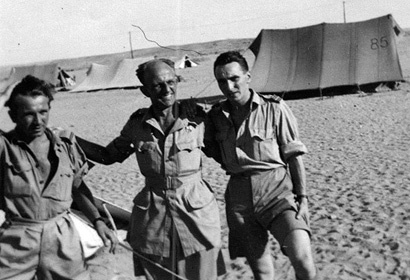 El Quassasin, February 1944: Uchwat (left), S. Buckiewicz, Gaworski, Turek. 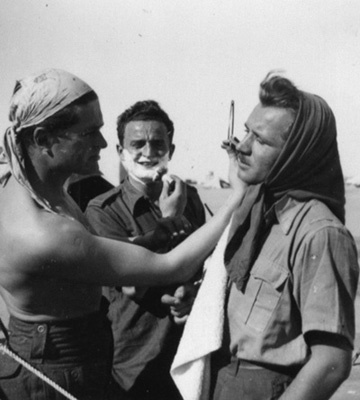 On right, G. Hamankiewicz prepares to give Z. Uchwat the Hitler's moustache, which he is sporting on the adjacent photo. B. Gaworski goes for a full shave. Left: El Quassasin, December 1st, 1943. Air Commodore Rayski's last the day with the squadron. 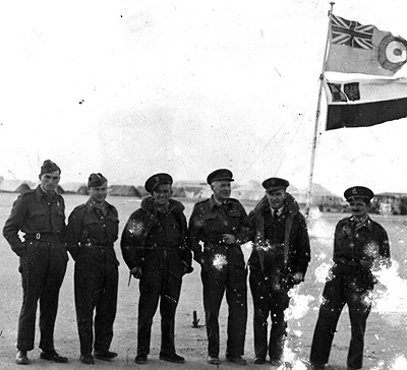 From left: F/O Szarzynski, F/Lt Gorniak, F/Lt Moszynski, Air/Com Rayski, F/Lt Berezecki and F/O Gadomski. 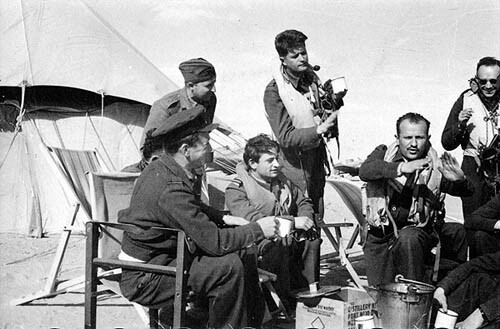 Right: mechanik, F/Lt Berezecki, mechanik and F/Lt Blaszczyk. Almaza, September 1943. 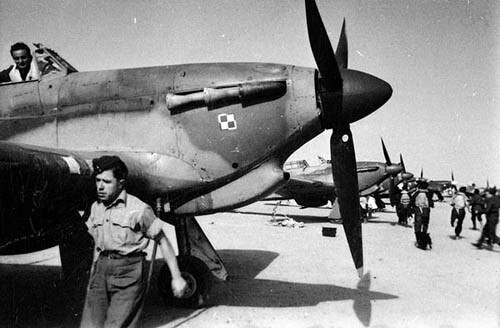 Located near Port Said, Almaza was the place where the squadron collected its equipment, including Hurricanes. 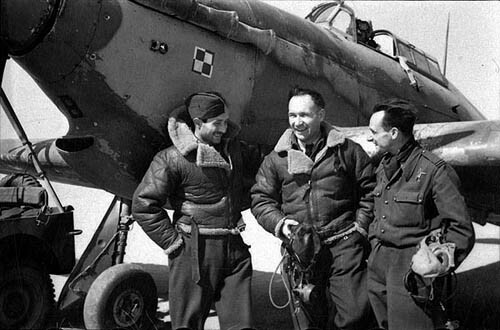 Left: F/O Uchwat, F/Lt Moszynski and F/Lt Blaszczyk. 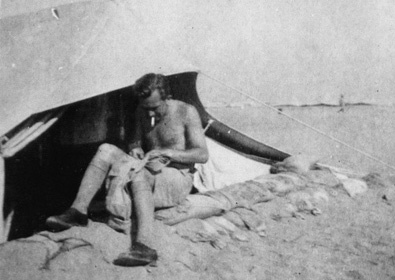 Right: Living quarters of the trio. 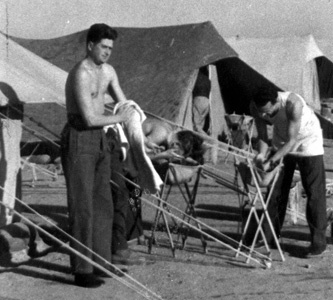 Notice the tent being pitched in a dugout, reinforced with sandbags. Almaza. Left: F/O Buckiewicz. 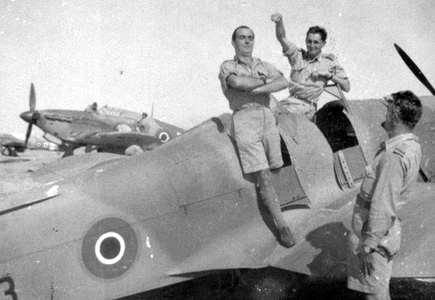 Right: F/Lt Berezecki, with one leg in the cockpit of Miles Magister (probably squadron's hack). Behind him is P/O W. Czerwinski. 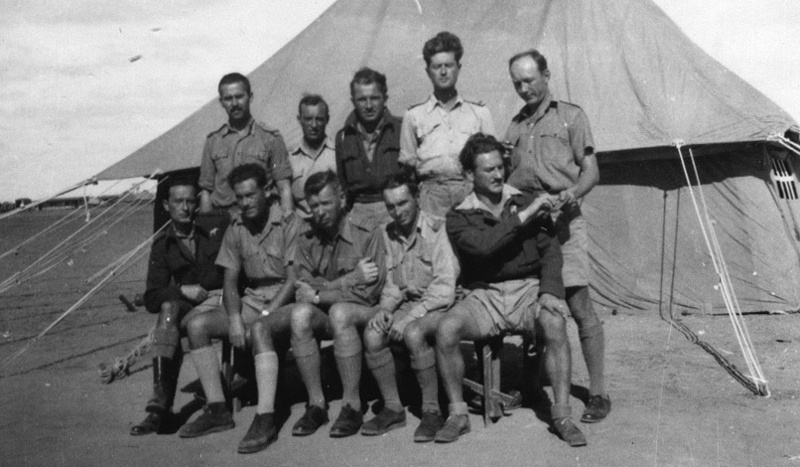 El Quassasin, December 1943. 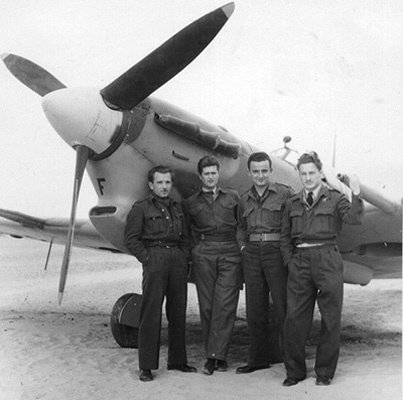 Air/Com Rayski (sitting in a middle) with the flight he flew. He flew 21 operational flights. El Quassasin, December 5th, 1943. Last posting for F/Lt Blaszczyk and F/O Glowacki. 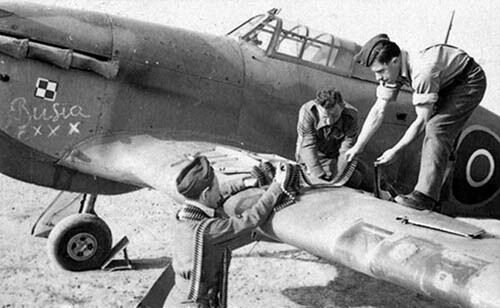 The unit's armourers loading Hurricane's .303 in (7.7 mm) Browning machine guns. Chalked "Busia", most likely was the name of the aircraft marked with letter B. At that time, the unit's aircraft did not carried its code letters. Seems like a staged photo of 318 pilots scrambling to their Hurricanes Mk II. Climbing to the cockpit of the plane in front is B. Gaworski. In the middle S/Ldr Wielochowski. 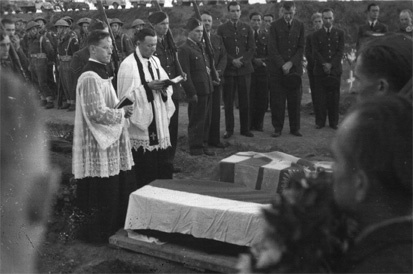 On his right side, probably F/O Kesserling (no relation to Luftwaffe's Marshall Albert Kesserling). Quassasin. 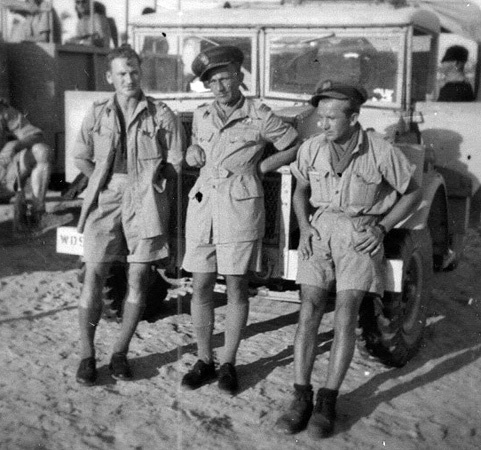 In front of the unit's signal truck stand the Signal Officer F/O Krzywonos (left). 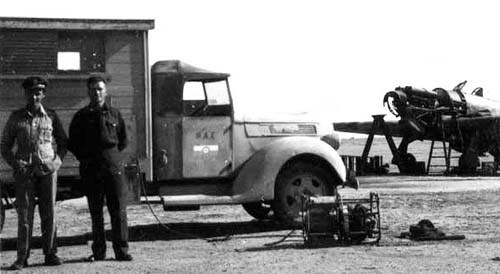 In the back, stripped of the cowlings, a Hurricane engine is serviced. Being in the training process, the unit's officers had time for site seeing. 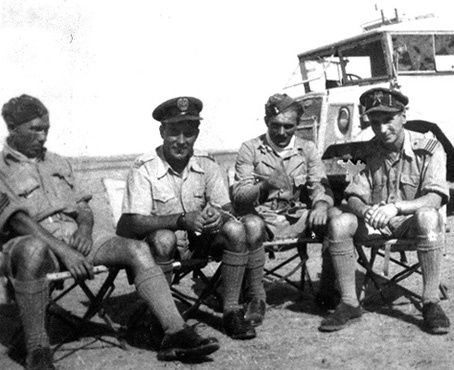 From left: J. Krzywonos; G. Hamankiewicz; unidentified British officer; S. Buckiewicz and Z. Moszynski. ?, ?, F/O Kon, F/O Buckiewicz, F/O Kalinowski and P/O Nycz. 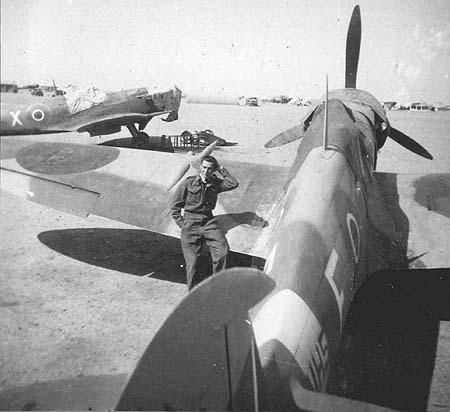 In the foreground is one of the first unit's Spitfire VCs : MH584 - F. This a/c was delivered in February 1944. In July that year the a/c was written off following a landing crash by P/O Nycz.